In the following outline, we would like to acquaint the readers of this newsletter with one of the most advanced and technologically best equipped clinical centres in Spain. This centre operates on an international level thus guaranteeing exchange of the most up to date knowledge on both a medical and surgical level. The intrinsic policy of VISSUM is oriented towards the achievement of a fundamental goal: the personal satisfaction of all those patients who visit our Institute and the continuous improvement of our patient care assistance. With this aim, ten years ago the creation of an ambitious project took place, the Instituto Oftalmológico de Alicante, with the idea of offering the inhabitants of Alicante and its surroundings high quality ophthalmic care. Since its creation, VISSUM Instituto Oftalmológico de Alicante has centred all its efforts on satisfying the needs of its patients. The professional team, who carry out their daily work in this health care centre, are highly experienced professionals, continuously searching for scientific and technological innovations that enable all those who visit us to receive the highest quality health care. Throughout these years, VISSUM has undergone expansion in both its activities and its geographical area, with the aim of bringing medical attention closer to the patients, providing further proof of the spirit of care that VISSUM offers its patients, putting into practice the philosophy that medicine should serve the citizen and not vice-versa, that every human being has the right to receive dignified and high quality health care. VISSUM constitutes a multicentrical structure of centres of excellence devoted to integral eye care, currently consisting of 27 clinics in Spain. More than 300 professionals work for VISSUM Corporación Oftalmológica where we help 150.000 people every year. 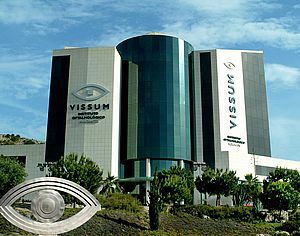 VISSUM Instituto Oftalmológico de Alicante is one of the best and most up-to-date European centres specialised in the study, diagnosis, treatment and surgery of eye diseases. In this sense, the great technological and scientific progress achieved in the field of Ophthalmology over the past years, enables us to offer a satisfactory solution to a wide range of ophthalmologic pathologies that until recently had no suitable remedy. From this point of view, VISSUM Instituto Oftalmológico de Alicante has played a major role in the progress in Ophthalmology over the last ten years. That is why this health care centre can offer its patients an almost perfect combination of high technology and the human factor formed by its highly specialised professional staff in the Ophthalmology field. This health care centre provides everyone, who comes to visit us, integral ophthalmic eye care without hospitalization and wherever possible avoiding unnecessary appointments and travelling for the patient. So, in the case of requiring a surgical procedure, this will be safe and performed using the most advanced and up-to-date technologies that exist in the world, without pain and using local anaesthesia. All this facilitates a quick rehabilitation after the surgical procedure and a subsequent recovery of the patients at their own home. When describing VISSUM Instituto Oftalmológico de Alicante, it is worth mentioning two differentiating factors in comparison to nearly all European centres with similar goals: its training and research. Thanks to these activities our Institute is contributing to a brilliant future of the Ophthalmology field and the eradication of severe eye diseases. Important quality accreditations, awards and recognitions guarantee the international prestige of the Instituto Oftalmológico de Alicante. As a world-wide recommended centre, the latest technological developments are obvious when you visit our facilities, and are of great assistance for the health professionals when deciding on the diagnosis. In conclusion, at VISSUM you will be able to find excellent professional staff assisted by the world’s latest technology, and whose principal objective is their commitment and daily work for the service of your eyes. With a surface area of over 7000 m2 distributed over 8 floors, in which the medical team comprising over 20 doctors and 100 faculty and staff members working under the direction of Prof. Dr. Jorge Alió provide full medical attention in the care and treatment of different visual diseases to over 70.000 people a year. The premises of the Instituto Oftalmológico de Alicante have a very large surgical area including three operating theatres for refractive surgery incorporating the latest technology and three more for general surgery. Cornea, Cataract, Anterior Segment, General Ophthalmology, Ocular Surface, Contactology, Vitreous and Retina, Pediatric Ophthalmology, Glaucoma, Uveitis and Ocular Immunology, Neuro Ophthalmology, Low Vision departments and the Clinical Research and Development area. To collaborate with the Industry both by proposing new projects and developing projects created by them. To divulge the scientific knowledge acquired by our Department to the Industry or to the clinics for the improvement of patients with visual impairment. Specialized facilities at VISSUM-Instituto Oftalmologico of Alicante, fully dedicated research staff and other collaborators from this Institution or from other collaborating private or publicly funded centres. Technical equipment located in VISSUM-Instituto Oftalmologico of Alicante and in the Surgery and Pathology Department at the University Miguel Hernandez, a collaboration that helps to achieve the scientific goals of both institutions. The scope of our Department in VISSUM-Instituto Oftalmologico of Alicante not only reaches all the other VISSUM centers in Spain but also the Miguel Hernandez University through the Surgery and Pathology Department directed by Prof. Alio, other national academic institutions, public institutions dedicated to clinical and basic research, pharmaceutical and technological industry and other private institutions that support scientific research in our country. 72 Active research contracts and agreements with 5 National Companies, 33 International Companies, 11 National Universities, 9 International Universities, 4 Research Centres and 10 Hospitals. The Jorge Alio Foundation is dedicated to the detection of visual anomalies and prevention of blindness through campaigns mainly aimed at the population in most need or at a high risk of suffering from visual impairment. The Jorge Alio Foundation also stimulates teaching, scientific research and medical care and has been developing this important task since 1988 on both a national and international level.